A solar home: for most people, this idea conjures images of rooftop photovoltaic (PV) panels steadily yielding electricity to power their computer, their TV or maybe even an electric car. Though were you aware that there is another type of solar that can help save money, even in the shower? A solar water heater is a system that uses the sun’s energy directly as a power source for heating your domestic hot water. Just like solar PV, a solar hot water system uses solar collectors (usually installed on a home’s roof), to capture the sun’s rays. However, these collectors are a little different from the PV panels you may be familiar with. 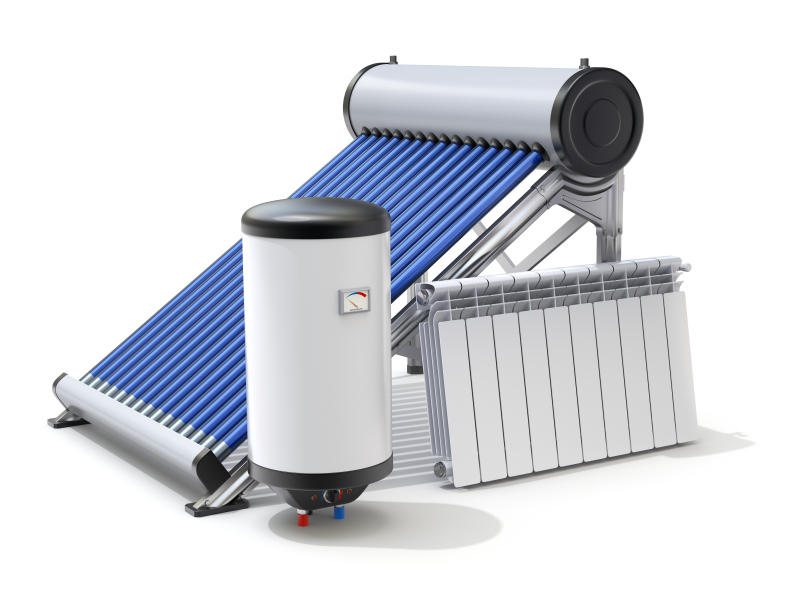 There are two types of solar hot water (also known as solar thermal) collectors. The most common is called a flat plate collector. It consists of a series of tubes inside a glass-faced panel, backed with a heat-absorbing layer. The other type is called an evacuated tube collector and is made from a series of borosilicate tubes — the same type of glass used to make Pyrex and laboratory glassware. Both types of solar collectors contain fluid, which heats in the sun and then circulates to a heat exchanger installed in the hot water tank. There, the heat gets transferred from the fluid in the tubes to your domestic hot water in the tank, ready for the next time you need to take a shower or wash the dishes. Most systems also include a backup energy source for water heating, such as electric or gas. How does solar hot water save you money? Consider this: Even in a cool, temperate climate such as Germany or Wisconsin, a solar water heater can easily produce 50-70 percent of your hot water needs. In a warmer area, this number could reach as high as 80 percent, according to Energy.gov. As you can imagine, that translates into paying half or less on your annual water bill. It gets even better. You can easily expect a solar water heater to last 20 years — far longer than a conventional water heater. However, many solar water heaters are still working well after 30 or more years. Remember that with solar hot water, fuel is free. Once the system has paid for itself, it can supply free heat for years. Additionally, because fuel prices tend to rise over time, you’ll be saving more the longer your system lasts. Does that mean it would be a good idea to order one right away? Not so fast. A solar water heater is a significant investment that makes more financial sense for some homes than others. The best way to find out if your house is suitable for solar hot water is to contact a qualified solar installer. The installer will visit your home to determine whether it would make sense for you to install a solar thermal system. Some of the factors he/she will analyze include how much sunlight your property receives, as well as how much hot water you use as a family. Typically, the more hot water you use the better your payback on a solar water heating system. If solar hot water sounds like a good option, here is one more way you can save money with solar hot water: renewable energy incentives. There is still time to qualify for the 30 percent federal tax credit on residential renewable energy systems (including solar water heaters) installed before Dec. 31, 2016. Finally, if you are purchasing a new home and are able to bundle the cost of installation onto your mortgage, you could even enjoy a cash flow positive return from your water heater with virtually no money down. Sounds like good reason to sing in the shower, don’t you think? Ryan McNeil is the president of Renewable Energy Corporation, a Mid-Atlantic residential solar energy company that is committed to installing quality, American-made solar panels, solar water heaters, solar attic fans and many more energy saving products.